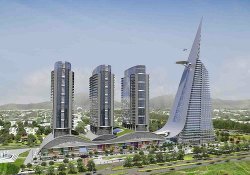 ISLAMABAD: Islamabad Deputy Commissioner (DC) Amer Ali Ahmed has instructed the circle registrar office to recover the land of National Institute of Electronics Employees Cooperative Housing Society (NIEECHS) within week as the deal made by the NIEECHS executive committee was against the rules. He has also ordered that if the recovery proceedings could not be completed within week First Information Report (FIR) should be lodged against management of the housing society and start criminal proceedings for the recovery and punishment. Daily Times published a news report on May 24 that 23 years ago NIEECHS purchased 212 kanals of land in Mouza Naugazi, Fateh Jang Road but later the management decided to grab the land with the alleged cooperation of land mafia and called general body meeting and proposed to exchange NIEECHS land. Islamabad Deputy Registrar also attended that meeting. The executive committee proposed that Mouza Naugazi’s land will be exchanged with land in Mouza Mughal Parri but in the end M/s Islamabad Corporation transferred scattered land near Radio Pakistan Rawat ignoring that the value of that land was less. It was further mentioned that agreement was only for exchange of land but NIEECHS sold 60 kanals of land to Mr Arif Javed Rao son of Bashir Ahmed Rao for Rs 19.5 million. Although price of land was showed less in documents to steal tax even then the amount was never deposited in society’s account. The Circle Registrar office was informed about it but he did not bother to take action. The DC took a notice of the news and decided to transfer the inquiry to Assistant Commissioner City Ali Randhawa to proceed under section 43 of Cooperative Housing Societies Act 1925, but meanwhile Circle Registrar filed report regarding society in which he stated that there was no permission to transfer land in Rawat and management had no right to sale out the land. After viewing the report, the DC instructed the registrar officer to start recovery process to get the possession of land in Mouza Naugazi located near Fateh Jang road and complete it within one week and if the executive committee did not cooperate an FIR against them may be lodged and criminal proceeding against the committee members and those persons who had purchased the land be started.After getting instructions the Circle Registrar office has decided to contact NIEECHS president Chaudhry Aslam, vice president Maqbool Minhas and General Secretary Javed Sheikh for the recovery of land.